These best practices aren’t carved in stone. These aren’t rules. The Twitters I follow are one of my sources of content that I share on Twitter and other social media platforms. However, not all tweets are retweet-able. There’s got to be a better way of doing this instead of retweeting Twitter handles after Twitter handles. If you are new to Twitter, read on. If your knowledge on Twitter is intermediate, hop on to the “Best Practices” section, then “Speak your Mind. Don’t retweet a tweet that is full of Twitter handles unless you have an ongoing conversation with all those folks. If you wish to thank the original tweeter, tweet directly to that person. It’s more personal that way. IRL (in real life), when someone says: “Hello” or “How are you? ” what do you do? You respond, riiiiight? Consider the “Hello” the beginning of a conversation. Retweet information that would benefit your target audience and your followers. 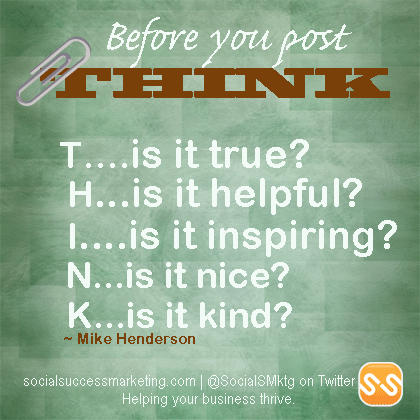 Think of this acrostic when clicking the “Retweet” button. Share others’ tweets too, not just yours. Include a personal comment about the post when you retweet, when possible. Ensure that the content is from trusted source before resharing it. Limit a retweet to 120 characters so others will have space to respond. Try retweeting topics that are neutral. Read before you share a tweet especiall if you do not know the source. Yes, your turn! What do you retweet? I know YOU too have something to share from your experience. Speak your mind. 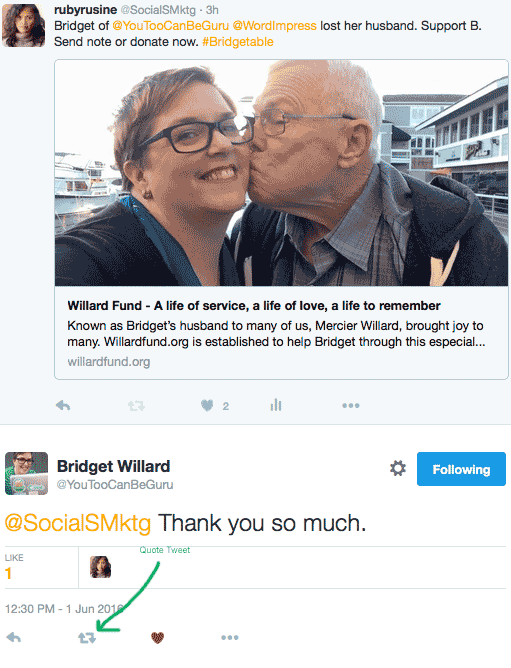 If you need help to “bring on the ‘social'” to your Twitter presence and other social media platforms, that’s what we do! Contact Ruby at ruby@socialsuccessmarketing.com.